Such rich humanity in these meditations! Rosofsky tenders both the light touch and life's sure gravities of age and decrepitude--the memorable and meaningless, the wince and grin, belly-laughs and heartbreaks, the pharmaceutical blur and the clarity of "ancient glittering eyes." A book for policy makers, caregivers, the halt and lame, upright and unencumbered: anyone who ever intends to grow old. When it comes to Hell, Dante Alighieri is the definitive tour guide. But for today's (and quite possibly tomorrow's) living hell, you'll want to take Ira Rosofsky's delightfully wry narrative along for the ride. He accomplishes what few authors are capable of--taking an unnerving topic and turning it into a book so enthralling you won't want to put down. Indeed, it's a meditation worthy of Marcus Aurelius and Jerry Seinfeld. .. Rosofsky presents a disturbing, often moving account of the lives of some of the two million men and women who reside in America's 18,000 nursing homes. The dispiriting tenor of the title and the emphasis on confused and depressed men and women are leavened with the author's bursts of wit, his welcome guidance on how to evaluate nursing homes and assisted-living centers and his frank ruminations on his own aging and health issues and the deaths of his parents and mother-in-law. What could have been a morose account of loss, suffering and death is lightened by the humorous and helpful treatment of an emotionally laden topic. As a society, we are far better at innovating than sustaining. 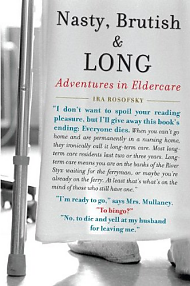 In this sharply observed, personal account of life among the elderly, Ira Rosofsky illuminates the paradox of growing old in America, which too often means a greater accumulation of years with sadly diminishing returns. With an eye for detail and a dark sense of humor, Ira Rosofsky takes us into a world most of us never wanted to see, and where we often avert our eyes when forced to. In this fascinating book, Rosofsky asks us to consider how we spend the extra years of life that our modern world has given us. The answer isn't pretty. Intertwining the stories of his parents decline and death with the stories of those he cares for who live in nursing homes, Rosofsky takes us down the modern version of the road to dusky death. The destination is the same, but this road is newly paved. Ira Rosofsky paints his tale with compassion and sensitivity, and it's a story that needs telling. Seen from his perspective as an elder care psychologist and the son of an aging father, he urges us to question the direction we have taken in our efforts to prolong life. If you are like me, his story will make you hope to escape such a fate. In Nasty, Brutish, and Long, Ira Rosofsky provides a rare glimpse into the hearts and minds of the aging. As a psychologist who has worked in nursing homes and an immensely talented and sensitive writer, he manages to find the perfect telling details to bring this often-neglected world alive for the reader. In an intriguing combination of personal story, social commentary, and scientific observation, a psychologist lifts the veil on nursing homes. Ira Rosofsky's presentation--laced with sharp humor--treats us to the nursing home experience from the variety of these viewpoints. All who have had experiences with nursing homes--whether as residents, relatives of residents, or as professionals--should read Nasty, Brutish, and Long, as should any who are interested in a penetrating view of how we as a society care for and care about those too frail or elderly to care for themselves. Nasty, Brutish, and Long is as much about the last years of life and the meaning of existence during old age as it is about nursing homes. Ira Rosofsky's personal narrative--along with the tales of the elderly he treats--contributes to a picture of the author as a fully engaged human being who tells his story with style and humor. And the story is an insightful and sensitive perspective on issues as varied as psychotherapy, psychopharmacology, the institutionalization of the aged, and our inevitable mortality. © 2008 Ira Rosofsky. All rights reserved.